Planet Hollywood may no longer be around, but you can still have their crunchy chicken. 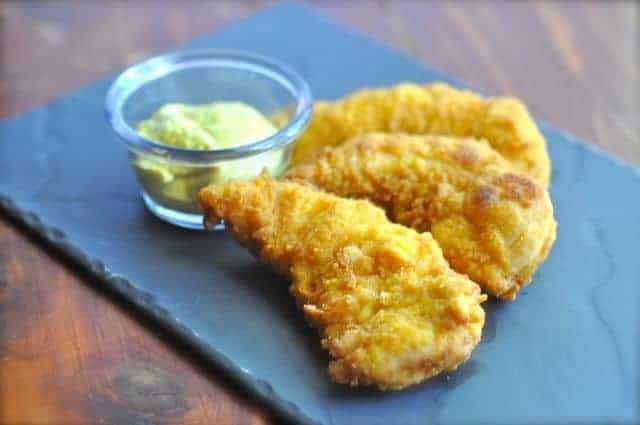 You gotta try these chicken tenders. Pulse cereals in the blender until the cereal is the consistency of fine crumbs, pour into a bowl. Combine flour, onion, garlic, and pepper in separate bowl. Beat eggs and mix with milk in the third bowl. Dredge breast tenders, first in milk mixture, then in flour mixture, and finally in cereal crumbs. Deep fry at 325 degrees for 3 - 4 minutes or until cooked thoroughly. Serve with Creole mustard. Another viewer suggests that you coat the chicken twice to ensure that it stays nice and moist. You start by saying “Planet Hollywood may no longer be around,”…. It is still around. Just ate there last night.